The theme of this international painting course is inspired by the idea that "Painting from nature is not copying the object; it is realizing one's sensations,” (Paul Cezanne). This idea will serve as the jumping off point for our week-long painting retreat led by Adeline Goldminc-Tronzo at the Château de La Napoule on the French Riviera. 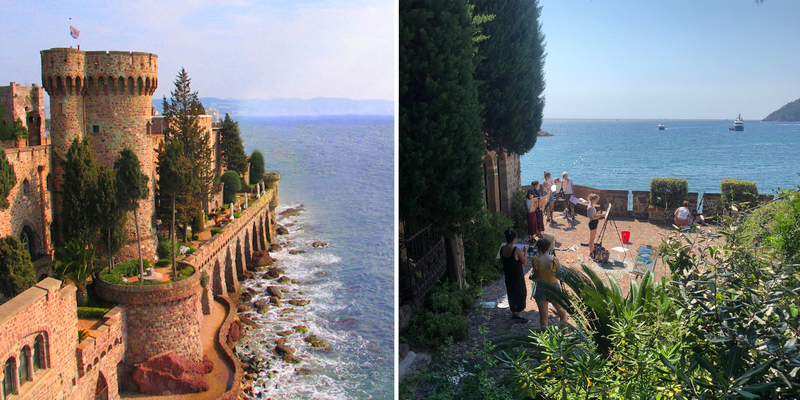 Working in oils, acrylics, watercolors, etc, students will live and work at the Château which is perched on the banks of the Mediterranean Sea in La Napoule, France. Students are housed both in the Château and in a private Villa on the grounds. Most meals take place in the grand dining room of the Château. With its eight acres of formal gardens and sculpture adorned architecture, the Château holds two coveted distinctions from the French Ministry of Culture: Monument Historique and Jardin Remarkable. We will hold an Informational Session on Sunday, December 2nd from 3:00-4:00PM in MECA’s Osher Hall. Meet Adeline Goldminc-Tronzo, discuss the curriculum, view slides from previous retreats and learn more about the history of the Château. Trip Fees: $1875 - $3000 per person (prices vary depending on single or double occupancy). This fee includes: course tuition, most meals (continental breakfast, dinner -Monday to Friday) and final group dinner. This fee does not include airfare. Nice, France (Aéroport Nice Côte D’Azur) is the closest airport to our destination, approximately 30 minutes away from the Château by car. There are flights from Boston (none direct, but all offer connections to Nice). NOTE: Each room is unique and each room is quirky in its own way. We will assign rooms as registrations come in so you are encouraged to register early if you have specific requests or needs. All accommodations are on the 2nd and 3rd floors. The first floor of the Villa has a fully equipped kitchen at our disposal, a living room, a dining room and a computer room with WiFi. There is also a garden patio and terrace. Please contact the CS Office if you have any other questions at: 207.699.5061. Click the button below to add the CTR 120-W19 | Artist Retreat on the French Riviera *DEPOSIT ONLY to your wish list.